Advanced earlybird tickets now available. 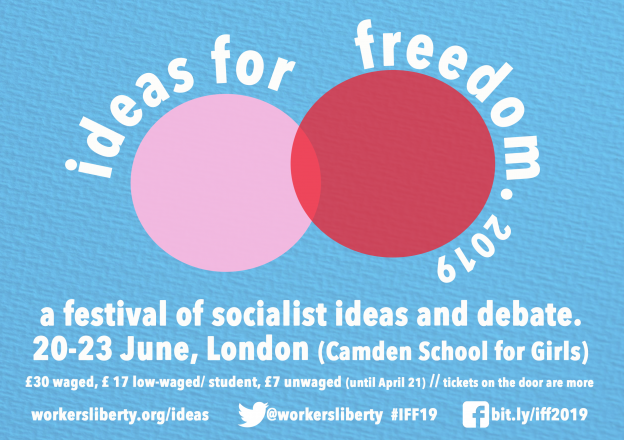 A festival of socialist ideas and leftwing discussion, hosted by Workers' Liberty, Ideas for Freedom is an opportunity to explore, through talks, film showings, workshops and debates, ideas about how our world works, and how we can fight for a better one. From 6.30pm. Join a guided walking tour with Ian Townson on the radical gay community and squats in and around Brixton Road from the mid-1970s to 1981, the year of the Brixton riots. • 1917 and the legacy of the Bolsheviks: Paul Vernadsky and Steve Smith. Venue: Camden School for Girls, Sandall Road, London, NW5 2DB. Free accommodation is provided with comrades who live in London. Please help us organise this by sending an email to office@workersliberty.org with the title "IFF accommodation" and telling us what nights you will need, how many people, and whether you have any specific requirements (i.e. no stairs, need a bed, fine with floor/sofa, no late nights etc.). A free professionally-staffed creche is provided during the weekend, and additional childcare can be arranged on Thursday and Friday nights if needed. 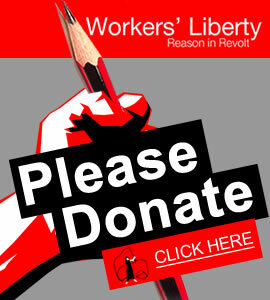 Please book a place by emailing office@workersliberty.org.